Navigator of the Seas was built at Kvaerner-Masa in Turku, Finland. Her yardnumber was 1347. Her passengercapacity is 3807 and a crew of 1181 take care of them. Navigator Of The Seas was the fourth ship of a class of five built for Royal Caribbean International. The name of the class was Eagle-class and these ships would be the biggest cruiseships in the world. 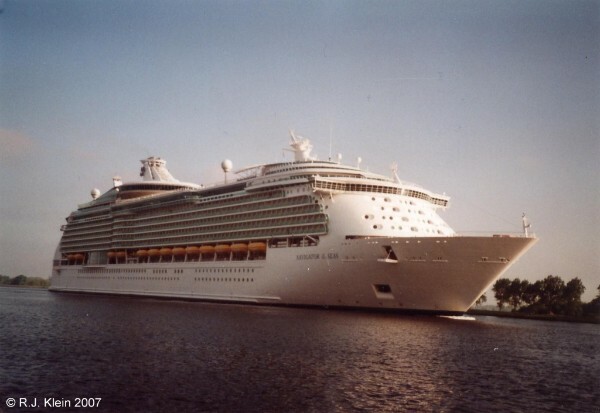 The Voyager Of The Seas, the first ship of this Eagle-class, floated out on the 27th of november 1998. The ship is 311,12 meters long, 38,60 meters wide and she has 14 decks available to her passengers. Her tonnage of 137.276 surpassed the Grand Princess with almost 30.000 tons. With four more sisters following, this was an amazingly big order within the cruise-industry. The most innovative feature on these ships is a true four deck high shopping street with shops and bars. A great number of inside cabins are facing to this street and this creates a unique experience. The second of the class to follow was the Explorer Of The Seas, with 137.308 tons slightly bigger then her earlier sister and thus she gained the title of the biggest one ever built. She was floated out on the 4th of november 1999. The Adventure Of The Seas (2001) had the same tonnage as the Voyager and she was followed by the Navigator Of The Seas, and this last ship has a tonnage measurement of 138.279, making her the biggest ship of the class and, when introduced, the biggest cruiseship ever built. The most striking difference between the three earlier ships of the class and the two last ones, is the placing of the balconies. In the first three ships, the balconies are located inside the hull, but those have been extended out of the hull in the newer ships, creating more inside space and so creating a higher tonnage-measurement. 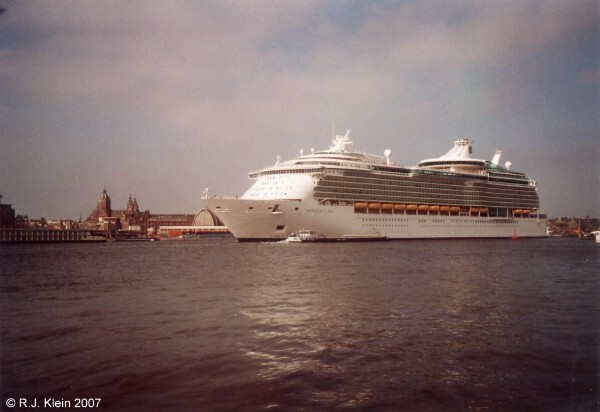 Navigator Of The Seas entering the port of Amsterdam at the 3rd of may 2007. At the time, she was the largest passengership to have visited the port of Amsterdam, but recently she has be dethroned from this title by MSC's MSC Preziosa, topping her by some 700 tons. This ship floated out on the 25th of january 2002 and with a tonnage of 138.279 she became the biggest passengership in the world. She was delivered on the 18th of november 2002 and named on the 6th of december in Miami. Her first cruise in the Caribbean started on the 14th of december. When Queen Mary 2 was floated out in march 2003 and delivered to Cunard Line at the end of that year, the Navigator Of The Seas lost her title of the worlds biggest, and the fifth ship of the Voyager-class, the Mariner Of The Seas, never had a chance to become the biggest when she sailed. From 2005 on, the Voyager Of The Seas was deployed in the Mediterranean Sea and the Navigator of the Seas was also send to Europe in 2007. One year later, she was replaced by the even larger Independence Of The Seas and the ship headed back to the Caribbean, taking up station in Galveston, Texas for yearround cruising. At the end of january 2014, Navigator Of The Seas recieved a make-over so she would be up to date in comparissent to the newest Quantum class of ships, as well as the Oasis-class. During a month in drydock, the ship was updated with a Flowrider surf simulator at the aft deck, new dining options, bow-to-stern WiFi and an oversized movie screen at the poolside. Also, 81 inside cabins revcieved 'Virtual Balconies', which means that inside are large screens that can show real-time oceanviews as well as visited destinations. Navigator Of The Seas is the first ship within the RCI fleet that offers this to the passengers. Of course, the company is not the first to introduce those 'inside cabins with a view', the last ships of the Sphinx-class of AIDA Cruises also offer this. At the 5th of february 2014, the ship made her first entrace to the port of Galveston. She has a large Lone Star Flag beneath the bridge, showing the dedication to the Texas market. She is the largest ship ever to use the port of Galveston yea-rround, a city that has seen significant growth as a cruiseport in recent years.